Description: You don't see these everyday! 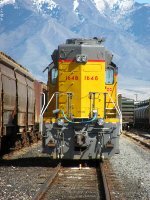 Description: Two standard cab UPs build a train just outside of Vegas. Description: UP 1648 working Johns-Mansville. Description: Local power in the form of GP units including an ex-SP unit with a longer long hood unit that once housed a steam generator. Parked at the Burmester/Stauffer Yard.